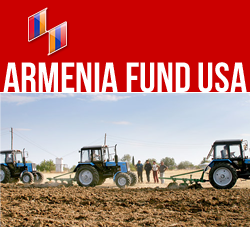 NEW YORK, New York — With a festive opening ceremony held on August 6, the Hayastan All-Armenian Fund unveiled the two newly renovated buildings of the Gyumri Children’s Home orphanage, in Gyumri, Armenia. The renovations were made possible by the fund’s German affiliate, through donations by longtime fund benefactors Mr. and Mrs. Hamo and Tamar Gregorian of Germany, as well as grassroots contributions to the 2011 Pan-European Phoneathon. The renovation project comprised a complete overhaul of the facility’s bedrooms, various therapy rooms, gym, cafeteria, kitchen, laundry room, and restrooms, as well as the installation of air-conditioning and fire-protection systems. In all, 900 square meters of space was refurbished. The opening ceremony was attended by several dignitaries and guests including Ara Vardanyan, executive director of the Hayastan All-Armenian Fund; Artem Asatryan, Armenian minister of Labor and Social Affairs; Bishop Mikayel Ajapahyan, Primate of the Shirak See; Gilbert Momdjian, chairman of the fund’s German affiliate; Andranik Mikayelyan, a member of the Board of the German affiliate; and Hamo and Tamar Gregorian and their children. Built in 1924, the Gyumri Children’s Home was used as a boarding kindergarten until 1972. Two additional wings were built in 1946 and 1993, respectively. Currently over 120 children with mental or physical disorders live and receive care at the facility. After they reach age 6, the children are placed in various specialized orphanages; among them are the Kharberd Orphanage and the Mary Izmirlian Orphanage in Yerevan. These subsequent placements are made based on assessments of each child’s mental and physical health, specific care needs, and prospects for improvement. For instance, children with eyesight disorders are placed in Yerevan’s No. 14 Boarding School, which specializes in the education and care of children with ocular diseases. As for children whose health improves following medical treatment, they are allowed to rejoin their families at the families’ request.